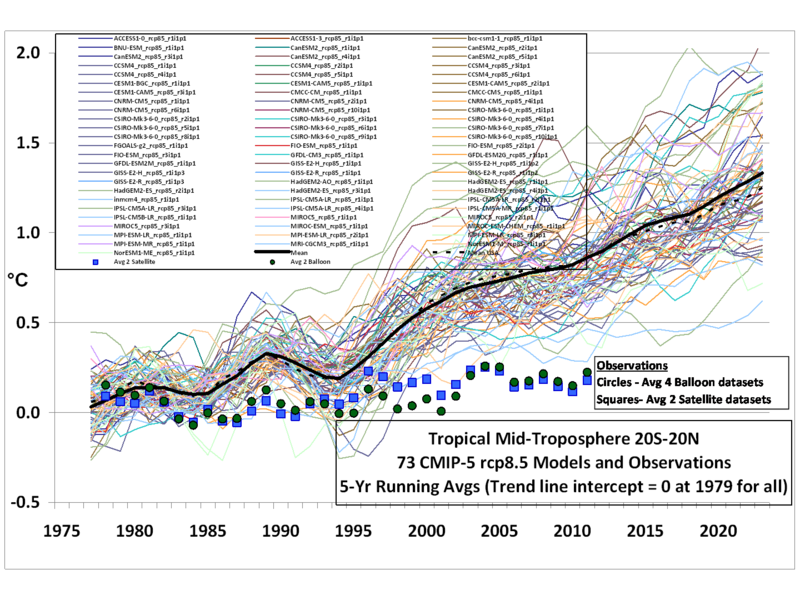 Dr. Roy Spencer has compared the output of 73 climate models to actual recent temperature measurements. He has focused on temperatures in the mid-troposphere in the tropics -- this is not the same as global surface temperatures but is of course related. The reason for this focus is 1) we have some good space-based data sources for temperatures in this region that don't suffer the same biases and limitations as surface thermometers and 2) This is the zone that catastrophic anthropogenic global warming theory says should be seeing the most warming, due to positive feedback effects of water vapor. The lines are the model results for temperatures, the dots are the actuals. I continue to suspect that the main source of disagreement is that the models’ positive feedbacks are too strong…and possibly of even the wrong sign. The lack of a tropical upper tropospheric hotspot in the observations is the main reason for the disconnect in the above plots, and as I have been pointing out this is probably rooted in differences in water vapor feedback. The models exhibit strongly positive water vapor feedback, which ends up causing a strong upper tropospheric warming response (the “hot spot”), while the observation’s lack of a hot spot would be consistent with little water vapor feedback. More on declining estimates of climate sensitivity based on actual temperature observations rather than computer models here. Looks like the actual temperatures are now outside the 2 standard deviation (the 95% certainty) level compared to the models. At some point the religion has to find a cause. 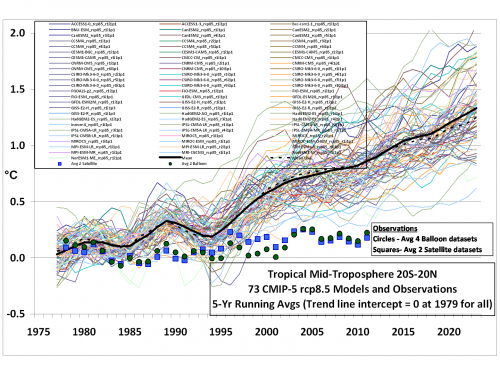 Care to explain why we should believe in climate models? I have a better activity for Larry. Don't worry, they have ocean acidification waiting in the wings. Looks like a perfect consensus . . . . 100%of the models fail. It would be more convincing if all of the measurements were shown, not just the averages. Ah the other use for the Internet. obloodyhell, can teach him about the Teacher Student genra :P - that might keep Larry occupied. Obviously, Roy Spencer has no credibility because he is religious, and is from The South. God, are global warmongers stupid. Seems like Media Matters has told Larry to focus on excusing the Obama administration from the various spying scandals which are now full bore. Media Matters thinks global warming can wait until the king is pure again. I guess we won't be hearing from him for awhile. So, this is good new, right? RIGHT? This is where sane people have a big party in the street, RIGHT? "Yay! We're not going to die a slow and slightly hotter death!" LOL! No, they like the slow death of the human race. So we get HFC's which are quite toxic, but at least they won't do mythical damage to the ozone layer right? Oh wait HFC's are 90x more powerful than CO2 as far as global warming is concerned so we have to ban these chemicals as well. The eco nuts don't want us to have air conditioning. They basically want us to live in the stone age and all die off. The eco philosophy is that humans are a parasite on the earth. i understand this is not the actual point of the post, but i wish youd spend some more time focusing on the other problems associated with climate change...such as ocean acidification. Where is the ocean acid or in danger of becoming acid? It has gone from extremely basic to almost as extremely basic. There is no danger for any of the shellfish whatsoever - and those who say otherwise are just trying to frighten folks to get grants and donations. The entire climate scare i just a crock. The vested interests are now established, and it's bloody impossible to change the narrative. Do a quick google search. i think theres a consensus that the ph levels are dropping, h+ ions increasing in concentration. the bigger issue you raise is what will the impacts be, and, more importantly, the costs of those. there's again evidence of impacts on coral reefs around north america, but what does that mean for people? i think the major impacts of climate change are the destabilizing of ecosystems, and that goes unnoticed in the general talks on climate change. We may be able to mitigate temp climbs and ocean acidification, but an ecosystem that shifts stable states is much harder to bring back. the focus shouldnt be on temperatures anymore because thats not the most important effect. i hope you ask me to provide sources. I am well aware - the oceans have gone from approx 8.2 pH to 8.1. Acid is less than 7.0. there are several factors why the ocean can't become acidic from co2 ( note part of the problem is that third world countries are dumping acid in the ocean) One is that it isn't a high school experiment where you supersaturate neutral water and show it gets slightly acidic. The ocean is very basic to begin with so adding CO2 will only make it less basic not acid. The carbonic acid is also a very week acid and the ocean will be saturated with CO2 long before the CO2 can make the ocean acid. Also Cabin exists in the ocean in two forms. The other form is in carbonates which are very basic. There is a complex cycle in which the carbon coverts from one form to another.